He came, he saw, he conquered. FIFA President Joseph S. Blatter was at his witty best during his short stay in New Delhi on Friday (March 9). In an age where almost every alternate Media Interaction stays a boring one, Mr. Blatter lit up the proceedings at the ITC Maurya with his customary humour. Mr. Praful Patel, the President of the All India Football Federation announced that India would be making two significant bids as far as World Football is concerned. “India are staging a serious bid to host the U-17 World Cup in 2017,” he informed. “Apart from that, we would also bid to host the 2015 World Club Cup. Both the Tournaments would provide an excellent opportunity for our players to rub shoulders with the best of the World,” he maintained. “I understand that there are challenges and limitations as well. But we will overcome all for the cause of the sport,” he added. Mr. Blatter who met the Prime Minister Dr. Manmohan Singh and the President, Mrs. Pratibha Patil during his stay in Delhi, however, didn’t commit on the two Tournaments coming to India. “FIFA stay a democratic setup. Both are positive developments no doubt. But it’s upto the FIFA Executive Committee to decide,” he opined. “I have been closely following the development of football in India. The FIFA Development Office is presently based in Delhi and the setting up of the Regional and the Elite Academies are a step in the right direction,” Mr. Blatter stressed. “I had referred to India as the Sleeping Giant during my last visit to India in 2007. But I know, the giant has started to wake up,” he opined. 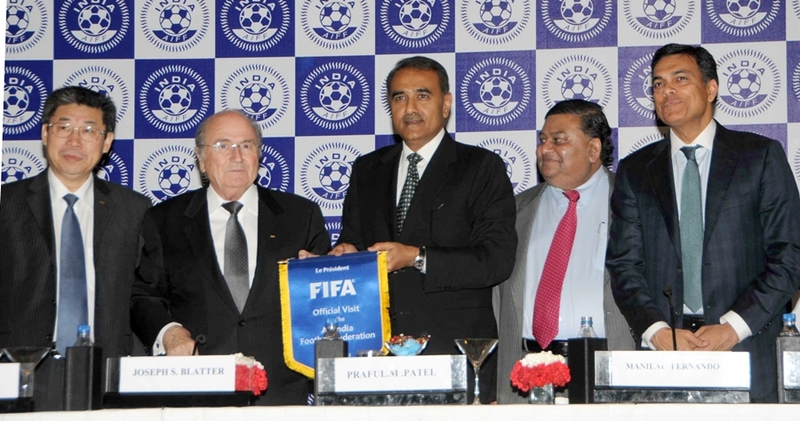 Mr. Patel added: “The two bids set a target for the AIFF and also the Government of India. We stay aware of the lack of good infrastructure at the moment. But I assure you, we will overcome all,” he reiterated. Mr Zhang Jilong, the Acting President of the Asian Football Confederation was also present on the occasion. Come together in Solidarity for ‘Peace Campaign on Terror’ on 26th Nov.